Those who’ve toured many parts of Central America tend to agree that Guatemala City is the least-welcoming city in the region, so it’s a little strange that a small town 30 miles away is one of the most welcoming. Antigua is arguably the most popular destination in the country, even more so than its beach resorts and the Tikal Ruins up north, so we’ll discuss the reasons its as beloved as it is here. 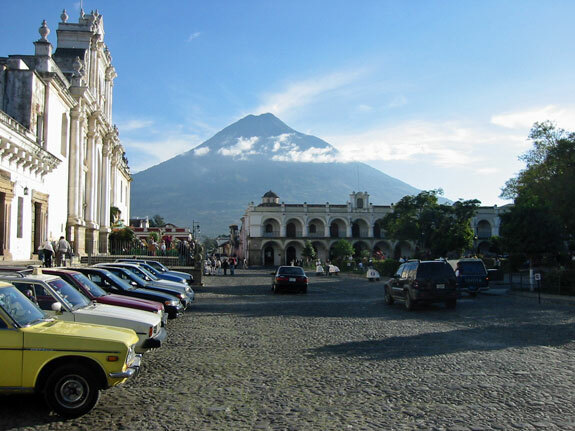 It really is worth mentioning that Guatemala City gives off a terrible first impression to the whole country, so it’s probably best to just take a shuttle or taxi directly from the airport to Antigua rather than spending a night or two in the capital to have a look. Sadly, it’s polluted, traffic-congested, and bursting at its seams. If you are adventurous and fluent in Spanish you might find some value, but most people get enough of it just on the drive to and from the airport. Whether you’ve spent much time in colonial cities in Latin America or not, Antigua is an ideal example. The town center is basically 8 streets in one direction crossed with 8 streets in the other, so it’s pretty much a chess board that you can walk from one end to the other in about 10 minutes. This small size makes it non-intimidating and easy to find your way around in. At its heart is an open block that serves as a park and the town center, and a couple blocks away is the open-air market that features both traditional food items from nearby farmers and ranchers, as well as souvenirs and local clothing. There’s a popular coffee plantation outside of town, and a popular volcano nearby, both of which make great day-trips, but Antigua is entertaining enough on its own for most people. You’ll find a mix of traditional restaurants where locals are the majority and tourist-oriented restaurants with menus in English and staff that are used to dealing with foreigners. Rice and beans are popular, but so are chicken, pork, and beef, so you won’t be going hungry for a lack of choice. It can be fascinating to just walk around the city center in a directionless manner, although crumbling sidewalks through much of the town mean you have to pay close attention. There are historic cathedrals and other colonial-era buildings scattered all over, set amongst more recent structures that are meant to blend in with the older style. It’s obviously not 100% authentic, but it’s as close as you are going to get, and the whole place is very photogenic. You’ll find plenty of upscale shops mixed in the city center area, since many tourists come with large bankrolls. Prices on most things are quite reasonable, and it’s also worth popping into a store or two to see a security guard holding a machine gun right in the middle of the shop. If you haven’t traveled much in Central America it can be shocking how few locals are fluent in English. The staff at 3-star and above hotels will usually be able to speak to you, but very few others can. There is a fairly large expat community in Antigua, and if you are thinking of joining them it’s critical to learn Spanish quickly. Fortunately, this might be the best place on earth to do just that. One of Antigua’s biggest industries is its language schools. There are many formal schools where groups of foreign students learn in a classroom setting. And better still, you can also live in a local homestay, where you live with a family in your own private bedroom, speaking to them in your newly-learned Spanish, and enjoying 2 or 3 meals a day. The cost for a weeklong homestay like this is usually under US$100, including the meals. Students report that this is a huge help in reinforcing the lessons they learn in class, plus it’s very cheap and a great way to learn more about the area, the culture, and make some friends. If learning Spanish quickly was your only goal then Antigua is the perfect destination. It also happens to be a charming place with mild weather most of the year as well.